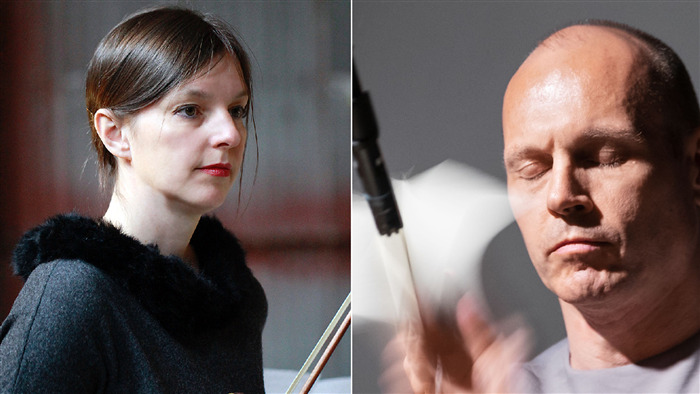 In this program, Barbara Lüneburg & Marko Ciciliani will perform works that directly emerged from two different larger projects in the field of artistic research. "Slices of Life" (2014-17) emerged from Barbara’s artistic-research project Transcoding, in which she developed a multimedia work in collaboration with an online community over the period of several years. Marko’s compositions "Kilgore" and "Formula minus One" resulted from the investigation of the artistic potential of elements from computer games in the context of audiovisual composition, which is the focus of the research project GAPPP (Gamified Audiovisual Performance and Performance Practice). Barbara Lueneburg is a performing artist of international reputation in the fields of contemporary music, violin, viola, electric violin and multimedia. Numerous compositions have been written for and in collaboration with her. She has made appearances at international festivals and concert series across Europe, the USA, Asia and New Zealand. Critics have described her playing as 'breathtaking’, ‘a musical cosmos’, ‘viciously virtuosic’, ‘passionate’, ‘translucent, ‘audacious’, ‘expressive and gripping'. In Barbara Lüneburg’s function as artistic director and manager of the ensemble Intégrales (1993–2012), an internationally performing chamber music group for contemporary music, she has premiered about 200 chamber music works and gained invaluable experience in programming, public relations, management and leadership. Lüneburg's arts-based research focuses on instrumental performance practice and performance studies, with an emphasis on collaboration, creativity, the relationship between performer and audience, charisma, participatory and game-based audiovisual art, and artistic research. From 2014 to 2018 she was director and lead artist of the artistic research project TransCoding – From ‘Highbrow Art’ to Participatory Culture funded by the Austrian Science Fund. In its framework she composed two major artworks in collaboration with an online community. In May 2018, her corresponding monograph TransCoding – From ‘Highbrow Art’ to Participatory Culture | Social Media – Arts – Research was released by [transcript], Bielefeld. Lüneburg holds a professorship for artistic research at the Anton Bruckner Private University and leads the university’s doctoral programmes. Additionally, she teaches master courses in contemporary music and gives talks on performance studies and artistic research in Europe, Asia, New Zealand and the USA. Ciciliani's music has been performed in more than forty-five countries across Eurasia, Oceania and the Americas. As a result of his interdisciplinary practice his work can be found in different genres. It has been programmed at festivals and concert series of electronic experimental music such as Experimental Intermedia, NYC, Club Transmediale, Berlin, SuperDeluxe, Tokyo, Ibrasotope, São Paolo and Findars, Kuala Lumpur; by festivals for post-avantgarde music such as Donaueschinger Musiktage, Wien Modern, Ultraschall Berlin, Huddersfield Contemporary Music Festival and Maerzmusik; just as well as in the context of media art, as in the festival Ars Electronica or with iMAL, Brussels. In 2009 Marko Ciciliani was the recipient of the prestigious Villa Aurora Stipend, a three-month artist residency in Los Angeles. He has been granted numerous project-residencies at STEIM, Amsterdam, ICST, Zürich and ZKM, Karlsruhe. In 2015 Ciciliani was granted funding for an artistic research project titled “GAPPP – Gamified Audiovisual Performance and Performance Practice”. It is funded as part of the PEEK program of the Austrian Science Fund and runs from 2016-20. Ciciliani is Professor for Computer Music Composition and Sound Design at the Institute for Electronic Music and Acoustics (IEM) of the University of Music and Performing Arts Graz. His work has been released on five full-length CDs and two books with data carriers containing transdisciplinary and audiovisual works. In addition, his music can be found on more than a dozen compilation CDs.